Do People Still Have the Power? Named one of the most influential people in the world in TIME Magazine’s TIME 100, Patti Smith is a poet, singer, songwriter, photographer, and fine artist. A seminal American artist, Smith has produced a body of work whose influence branches out through generations, across disciplines, and around the world. Smith and her band have released 8 studio albums on Arista Records from 1975-2002, including Horses, Radio Ethiopia, Easter, Wave, Dream of Life, Gone Again, Peace and Noise, and Gung Ho. In 2004, on Columbia, she released Trampin’, a critically acclaimed album whose varied subject matter includes motherhood and the preemptive strike on Iraq. Her 2007 release, Twelve, a collection of cover songs, was hailed by many as the best of the year. 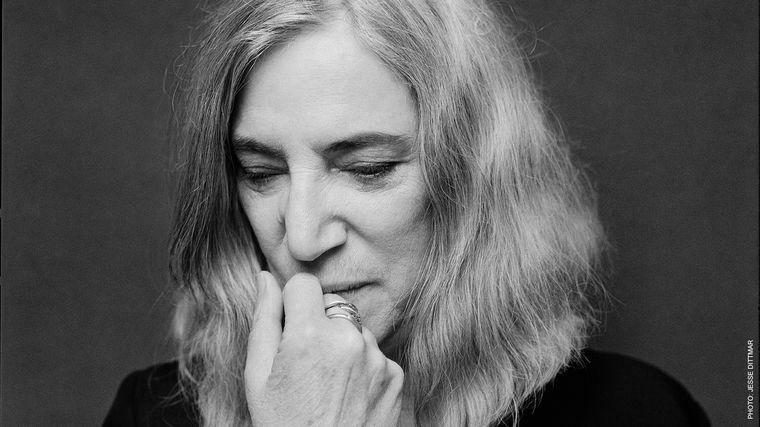 In 2011, Patti Smith was listed amongst the TIME 100 most influential people in the world, as well as one of Rolling Stone’s 100 Greatest Artists. Smith is also the author of Witt, Babel, Coral Sea, Woolgathering, and Auguries of Innocence. As a fine artist, Smith has exhibited at galleries and museums worldwide. Represented by the Robert Miller Gallery in New York since 1978, her exhibitions include Strange Messenger, Land 250, and Camera Solo. Steven Sebring’s 2008 documentary about Smith, dream of life: the movie, was acknowledged internationally and received an Emmy nomination. Smith was named a Commandeur des Arts et des Lettres from the French Ministry of Culture and has been awarded honorary doctorates from Rowan State University, Pratt Institute of Art, and the School of Art Institute Chicago. She was honored by ASCAP with the Founders Award, representing lifetime achievement, and is the recipient of Sweden’s Polar Award, an international acknowledgement for significant achievements in music. In 2013, Smith was awarded the Katharine Hepburn Medal from Bryn Mawr College, which recognizes women whose lives, work, and contributions embody the same drive and accomplishments as acclaimed actress. In 2014, Barnard College Board of Trustees presented Smith with a Medal of Distinction that honors individuals who have demonstrated a commitment to excellence in their communities and their careers. Maureen Dowd Calls Patti Smith's Memoir, Just Kids, "Achingly Beautiful"